Question: How is Bat & Ball Exit Speed Effected by Bat Size? In this baseball swing tips experiment using the Zepp (Labs) Baseball app , I wanted to use the Scientific Method to analyze what would happen to Bat Speed at Impact and Ball Exit Speed if I used a Mizuno Generation 33-inch, 30-ounce BBCOR versus a 34-inches, 31-ounces, same model. CLICK HERE for an article titled “The Physics of Baseball”. Read under the subhead titled, “Swing speed vs. bat weight”. The following information I received from a long time PocketRadar rep. It’s what he does for a living. A 1-mph of ball exit speed (BES) increase, adds 4-feet of distance to a batted ball (a 1:4 ratio). So for instance, if an 9 year old hits the ball with 50-mph of ball exit speed, then they have the capability of hitting the ball 200-feet (50 X 4 = 200). On the professional side of things, I’ve heard that scouts are actively looking for 95-mph+ ball exit speed in games because that hitter has the ability to hit the ball at least 380-feet. That’s hitting the ball out down the lines, and to the gaps, at most ballparks. It’s also interesting to note that you can add about 5-15-mph to ball exit speeds taken off a tee, to simulate what it would be in a game. That extra 5-15-mph will depend on the pitcher’s velocity. Based on the above baseball swing tips experiment research, I think swinging with the Mizuno Generation 34/31 will, on average, increase my ball exit speed. I think that my bat speed will come down a bit using the 34/31 over the 33/30 because of the added weight and length. Also, “trading up” a bat size will depend on how much forward momentum a hitter uses. The less FoMo, the harder it will be to trade up. A friend of mine, Juan Ortiz, took Ball Exit Speed gun readings while inputting into this Google Doc spreadsheet. You’ll notice on the baseball swing tips experiment spreadsheet that there are missing numbers, these were radar gun mis-reads (where the radar gun lost coverage of the batted ball’s trajectory). We eliminated ten mis-reads using the 33/30, and thirteen mis-reads using the 34/31. We then adjusted the average swings in each test. For instance, we eliminated 13 mis-reads using the 34/31, so spreadsheet added all swing ball exit speeds for that test, then divided by 87 total swings. However, the Zepp app readings were all averaged over 100 total swings. “34/31 Mizuno bat swings” were letter ‘B’. 200 total swings were completed in the experiment, 100 per test. Counter-balancing helps remove the “getting tired” and “not being warmed” up factors. Now, we took readings with the Zepp app and with the Bushnell radar gun. Please note, these aren’t an apples to apples comparison, so we’ll be looking at them in separate detail. Zepp app findings – as you can see, there was an average increase of 1-mph in Bat Speed at Impact using the 34/31 Mizuno Generation bat. 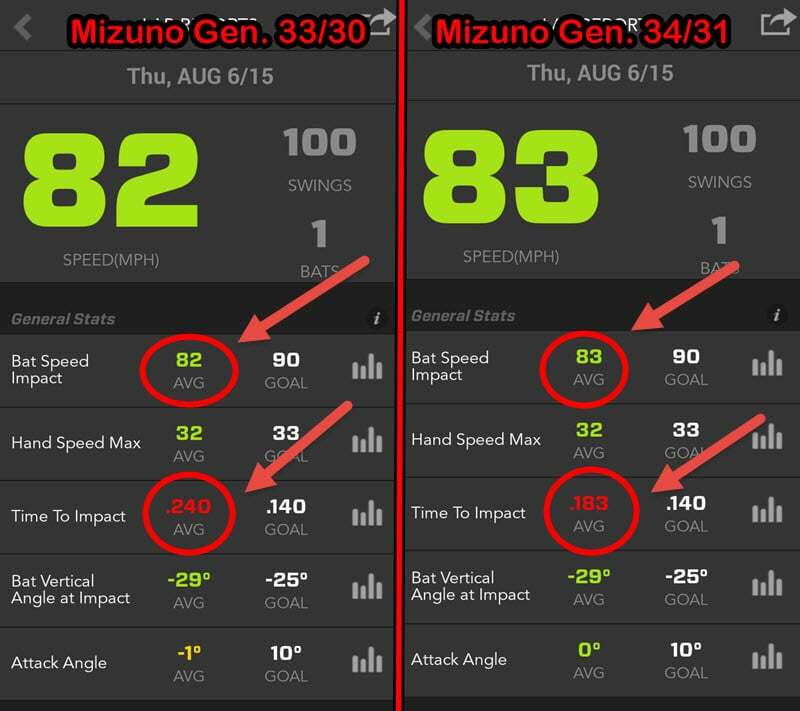 Zepp app findings – there was also average 0.057 sec drop in Time To Impact with the 34/31 Mizuno Gen. bat. Bushnell BES radar gun findings (Google Doc) – there was an average Ball Exit Speed increase of 2-mph when using the 34/31 Mizuno Gen. bat. I did not expect to see a major difference in Time To Impact like we did in the baseball swing tips bat size experiment. 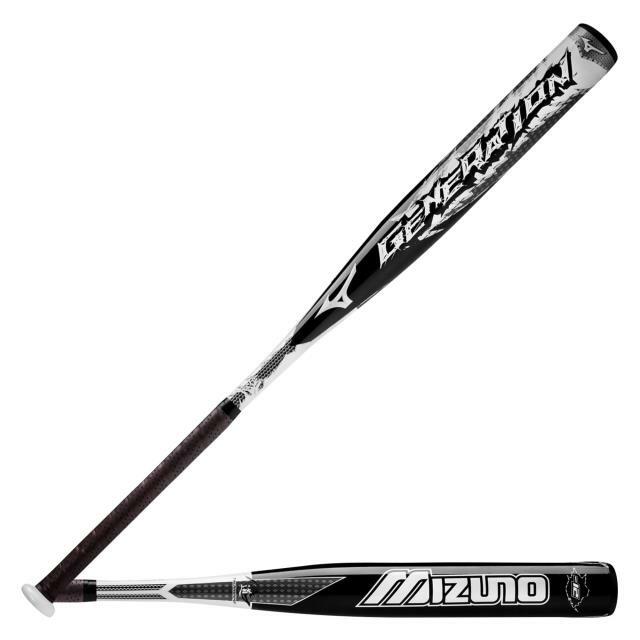 I thought that average Bat Speed at Impact when using the 34/31 Mizuno Gen. bat was going to be less than the 33/30, but it actually increased by 1-mph! What else is interesting in looking at the baseball swing tips experiment spreadsheet, that after about 75 total experiment swings, I started to consistently hit more 90+mph’s and find my highest BES readings. Similar to how many pitches it takes a pitcher to actually “get warm”. This is why we counter-balance the experiments now, to sidestep the “warm-up factor”. In this baseball swing tips experiment, using two different sized Mizuno Generation -3 BBCOR bats, we found that (for me), the 34/31 added 1-mph of Bat Speed at Impact and 2-mph to Ball Exit Speed, on average. I was amazed to learn that using the bigger bat actually cut down on Time to Impact. Some interesting findings and ones I hope others will test for themselves in the future. My parents ask me the “bat size” question all the time. So, by investing in a Bushnell radar gun or PocketRadar gun , you can gather some pretty convincing data as to which bat to use. Joey – What is your theory on the increase in bat speed and decrease in time to impact with a heavier bat? Seems pretty counter-intuitive! Maybe you use your big muscles better and unweight the bat better to stay efficient with the heavier one? Matt, I think you’re right. Maybe I subconsciously un-weighted more with the heavier bat. One of my readers emailed me and thought maybe the weight of the bat dropped into the zone faster. I dunno. Further tests will definitely have to be done. This is a relatively small sample size, 200 total swings. Coach DeLong, I’m right there with ya! And according to Physicist Dr. Alan Nathan, he says the bat’s MOI (Moment Of Inertia – where the center mass of the bat is located) has more to do with increasing Ball Exit Speeds than size or weight of the bat. In other words, with all things being equal, top heavy bat (MOI closer to end) will produce higher Ball Exit Speeds than balance weighted (MOI closer to hands) ones.